My husband is wearing this make-up I applied. 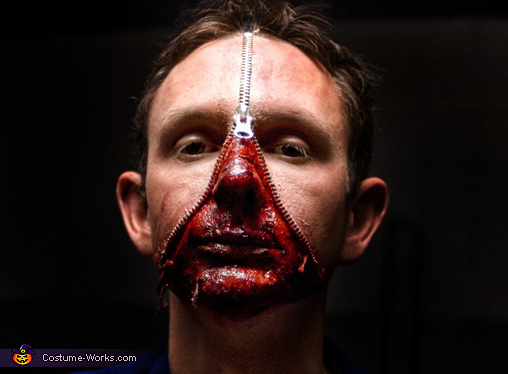 I bought a zipper, some latex, blood paste, stick glue, spirit gum, foundation, cotton, and red paste makeup. Applied the zipper first with spirit gum and stick glue. Let set and then applied the liquid latex to the edges. Let set and then applied liquid foundation. Applied cotton and liquid latex throughout mouth area, let set and then picked at latex until it looked like peeling flesh. Last added blood paste. Thats really clever! great job.